The V8 Super Breaker Bar is able to loosen tough nuts in a single turn. Tough as nails, big and long. Gives you the torque you need. This unique tool lets you use a 1/2"dr gun w/ 3/8"dr sockets. It is designed extra tough to prevent flexing. 3/8" Dr. 4pc Universal Joint Extension Bar Set Chrome plated, spring-loaded universals. 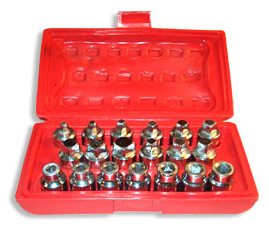 Chrome universal joints for use with hand ratchets or other chrome drive tools. V8's spring-loaded swivel design prevents premature loosening and sloppiness common in conventionally made universal joints and sockets. Durable, spring-loaded impact universal joints featuring V8's new safety ring to prevent any movement of the pin during the impacting process. Extraordinary value for the money and individually carded for display puposes. A strong, spring-loaded 3/8" impact universal joint featuring V8's new safety ring to prevent any movement of the pin during the impacting process. Extraordinary value for the money and individually carded for display puposes. A strong, spring-loaded 1/2" impact universal joint featuring V8's new safety ring to prevent any movement of the pin during the impacting process. Extraordinary value for the money and individually carded for display puposes. Durable spring-loaded impact universal joints featuring V8's new safety ring to prevent any movement of the pin during the impacting process. 3 of the most popular lengths to get to those hard to reach places. Durable, spring-loaded impact universal joints featuring V8's new safety ring to prevent any movement of the pin during the impacting process. Extraordinary value for the money and individually carded for display purposes. All our sockets are made out of a super-strong, drop-forged alloy steel. Sizes:8mm male Sq.,10mm male sq.,1/2" male sq.,10mm female sq. For removing oil drain plugs,oil pans, transmission pans & plugs, differential covers & plugs, etc. These sockets are made extremely strong for undercar work.